The library is my new best friend. I don’t know why I never really used the library before, it just never occurred to me. But do you know that instead of dropping tons of money on buying books you can just, you know, rent them for a short period of time? For Free? I know, quite the revelation. Again, I do not know when this little tidbit of information was filed in the old mental Rolodex under “not important”‘ but it was. And then I was over at my Mother’s house while she was preparing for a trip and she asked me if I wanted to go to get some books with her. You know, so that she had something to do on her trip. Always up for a run to the bookstore I was happy to oblige. Actually, she could have said we were going to a car wash and I would have jumped at the opportunity to go sit in a car with her while my Father and Husband got to stay at the house and take care of the Rug Rat. Some times I just need a little “away” time. Imagine my surprise when we rolled up to the Library instead of a book purveyor. As I was wandering the aisles full of FREE books a light-bulb went on and now … I am like a kid in a candy store. And guess what kinds of books libraries have snuck in there among the oh-so-serious Literature and not-so-serious Vampire Romance Novels? ———- Cookbooks! I took it on a date and now I am ready to marry it. If I can find 4 or 5 recipes that I really want to try in any given cookbook then I pretty much consider it to be a decent cookbook. 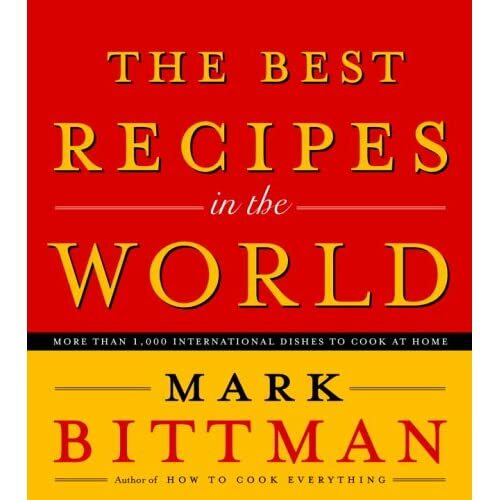 While reading through this manifesto on International Cuisine I was able to find 4 or 5 recipes in a two page spread that begged me to be prepared, repeatedly. Does this mean I can quit going to the Library? Hell no. I am still going to date like a dating person in a box marked “The Dater”, but maybe now I can make room for more of that serious Literature during my reading time. Still won’t be reading any Vampire Romance novels tho.